The theme of this year’s exchange is “No Such Thing” Feel free to interpret this in any manner you can imagine. Requirements: Any EDITIONABLE art media may be used. (Just a few examples: woodcuts, litho, digital printmaking, etc.) Each of the prints should be the same. The post card must be no larger than 4”x 6”. 13 identical prints should be sent individually to the address posted below. Each card must be stamped and will bear the markings of travel and the postal service. Edition must be numbered 1/13, 2/13, 3/13… DO NOT send the cards together in one envelope. Donations Requested: Please send separately a donation to help pay for postage in the form of cash or a check payable to the Graphic Arts Guild. Send more if you can, less if you can’t. 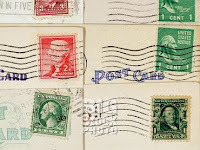 MAIL BY JANUARY 1, 2010. ENTRIES DUE FRIDAY, JANUARY 8. Artwork received after January 8, 2010 will not be included in the exchange. Please postmark prints with sufficient time to arrive. After receiving everyone’s postcards the Graphic Arts Guild will randomly divide up the cards and you will be sent 12 new and different prints from other participants. The Graphic Arts Guild will keep one of the 13 for The JSU Art Department Works on Paper Collection. Postage and handling for returning the 12 new prints will be paid for by the Graphic Arts Guild. Your donation will help us out tremendously. First of all, on behalf of the members and officers of the Southeast Chapter, I would like to welcome our new members for 2009: Barbara Eaton of Savannah,GA, Bridget Elmer of Tallahassee, FL, and Susan Leeb of Chapel Hill, NC. I would also like to thank all of our members for their continued interest in and support of the Southeast Chapter. A special thanks is extended to Martha Ebener of Decatur, Georgia who has served as our Secretary and Membership Officer. Ms. Ebener has recently resigned the office of Secretary/ Membership. Thank you, Ms. Ebener, for all of the time and energy that you have given to the Southeast Chapter. As assigned by the remaining officers, I am happy to fill the position of interim Secretary and Membership Officer. Elections for chapter offices will take place in 2010. If you have any questions or concerns about chapter membership, I welcome your e-mails. Our newsletter editor, Ellen Knudsen and I have been working to create an opportunity for members to contribute to our blog newsletter. I have offered to help Ellen field this opportunity for members. If you would like to be a guest blogger or regular contributor to the blog, please let us know. As a guest blogger, after submitting a proposal, you would have a week of blogging and could post about upcoming events in your area, share techniques or showcase current work or any other related topic of your choice. As a regular contributor, you could propose to submit once or twice a month or even on a weekly basis. Or if you would just like to let us know about book related events in your area but would rather someone else do the blogging, e-mail us with the details. Your SEGBW officers would love to hear your ideas or help with an event in your area. Get in touch! The exhibition runs September 18 – October 31, 2009. Link to the exhibition is here. If your work is also in this exhibit and you are a current SEGBW member, please let us know -- we'll be glad to put your name and images of your work on this blog! For now, way to go Emily!!! Letterpress and playbills as well as hand binding will be on display at the University of South Alabama Library, third floor gallery display cases September 1, 2009 - December 18, 2009. Mary Ann Sampson began making unique books after participating in a conceptual bookmaking workshop with Keith Smith at the Visual Studies Workshop in Rochester, New York. Sampson gradually incorporated her books into small theatrical settings. Louise L. Foster is a self-employed book conservator and does hand binding, repair and paper decoration. She studied under Don Glaister and Wesley Baker in the Book Arts Program at the University of Alabama. Ian Robertson does fine letterpress printing of books, broadsides and ephemera with an emphasis on typography and composition. He is self-taught with the great help of outstanding mentors in topography, printing and illustration. The public is invited to view their works during library hours: http://www.southalabama.edu/univlib/info/hours.html. Link to the exhibition here. Mary Ann Sampson and Louise L. Foster are both members of the Southeastern Chapter of the Guild of Book Workers. The Friends of Dard Hunter will have their 21st annual meeting, In the Spirit of Dard Hunter, the Art & Craft of Hand Papermaking, in Atlanta, Georgia on October 14th–18th. 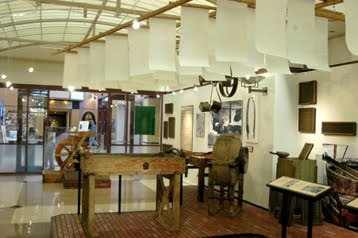 The meeting is hosted by the Robert C. Williams Museum of Hand Papermaking, Home of the Dard Hunter Collection. Workshop cost: $250.00 includes instruction, lunch, supplies, and your own creations! For workshop registration, please visit www.sarvisberry.com. For more information contact Gibby Waitzkin: gibby@sarvisberry.com or 540-745-6330. For hotel accommodations go to www.visitfloyd.org or floydcountyartisantrail.org. Announcing Book Arts Classes offered at Florence Thomas Art School, in Glendale Springs, NC (just off the Blue Ridge Parkway). On-site lodging and some meals are available to registrants, and the 10.3-acre campus offers a delightful place for creative exploration. As noted on the Florence website, "the campus itself, spread open to the south and the sun, is in a beautiful setting—a large pond, meadows, many trees, gentle hills, a wonderful view into the distance." On display May 15 – August 15, 2009 at the Minnesota Center for Book Arts. For more info, see the MCBA website. The exhibition will be shown at Emory University in Decatur, Georgia as the final venue for the exhibit January 14-March 20, 2011. Check out the Atlanta Printmakers' Studio website for a list of terrific classes going on this spring and summer! Intaglio Copper Plate etching; Polyester Plate and Paper Lithograhy; Letterpress Class (Day); Letterpress Class (Night); Singular Prints (2-Day workshop); Solar Plate workshop; Cyanotype workshop. Fifteen photographers including Kim Pearson, Stephen Savage, Pinky/MM Bass, Tom Loehr, Catt Sirten, Kelly Kleinschrodt, Keith Necaise, McLeod Turner, Susan Steber Kangal, Molly Dugan, Martha Davidson, Erin Hilburn, Mary Riser, Kristy Johnson-Snell and William Bunce have contributed to these hand-sewn and hand-decorated books. Visit the Website for history on the project. Upcoming Papermaking Classes at BookWorks in Asheville, North Carolina! The class will focus upon the exploration of two different forms of paper sculpture by using various papermaking fibers. One method of sculptural exploration will involve a cloth muslin armature filled with sand. Dampened sheets of handmade paper will be used to cover the armature using methyl cellulose as the adhesive. In the second form of sculpture, we will work directly on the papermill couching stand to initially form the sculpture, and with the use of sunlight and other sources of heat, convert the two-dimensional form into a three-dimensional one. Information for educators wishing to use these techniques is provided. BookWorks Inaugural Paper Class: Using a variety of fibers, we will learn the basics of papermaking and the production of paper pulp using the Hollander beater. Sheet formation will be the focus of the course, with the development of your hand skills emphasized so that you may pull a consistently even set of sheets. Discussions will include how handmade paper may be incorporated into book arts and other art projects. Using a variety of fibers, we will learn the basics of papermaking and the production of paper pulp using the Hollander beater. Sheet formation will be the focus of the course, with the development of your hand skills emphasized so that you may pull a consistently even set of sheets. Discussions will include how handmade paper may be incorporated into book arts and other art projects. For more information, visit the Asheville BookWorks website. Play with your food and eat your words! Literacy Volunteers of Atlanta (LVA) and the Southeast Chapter of the Guild of Book Workers invite you to unleash your imagination and your culinary talents for the sixth annual Edible Book Festival. WHEN: Saturday, March 28, 2009, 3:00–5:00 p.m.
HOW: To participate, create a piece of edible art related to books—old or new—fiction, nonfiction, plays, poetry, etc. Entries should promote anything related to books: a scene or character from a book, play, short story, comic, or poem; a book cover; or a book’s structure. Savory or sweet, all ingredients must be entirely edible. You may use chocolate, cheese, vegetables, fruit, and more. Use your imagination! WHO: Culinary and educational organizations, restaurants, artists, bibliophiles, and the public are invited to compete or come and enjoy. Literacy Volunteers of Atlanta, 246 Sycamore Street, Suite 110, Decatur, GA 30030, or call 404.377.READ. Deadline for registration is Friday, March 20, 2009. The International Edible Book Festival is an annual event held throughout the world, uniting bibliophiles, book artists, and food lovers to celebrate the ingestion of culture and its fulfilling nourishment. For more information about Edible Books internationally, go to www.books2eat.com. The Johnny Cash Flower Pickin' Festival is an annual event that takes place in Starkville, Mississippi where Johnny Cash was inspired to write the song "Starkville City Jail". The event honors the spirit of redemption, the depth, and humanity of Johnny Cash's life and music. 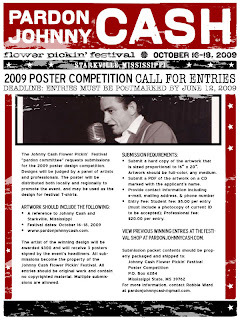 The Johnny Cash Flower Pickin' Festival "pardon committee" requests submissions for the 2009 poster design competition. Designs will be judged by a panel of artists and professionals. The poster will be distributed both locally and regionally to promote the event, and may be used as the design for festival T-shirts. The artist of the winning design will be awarded $300 and will receive 3 posters signed by the event's headliners. All submissions become the property of the Johnny Cash Flower Pickin' Festival. All entries should be original work and contain no copyrighted material. Multiple submissions are allowed. • Submit a hard copy of the artwork that is sized proportional to 16” x 20”. Artwork should be full-color, any medium. • Submit a PDF of the artwork on a CD marked with the applicant's name. • Entry Fee: Student fee: $5.00 per entry (must include a photocopy of current ID to be accepted); Professional fee: $20.00 per entry. View previous winning entries at the festival shop at pardonjohnnycash.com. For more information, visit the Pardon Johnny Cash website or contact Robbie Ward at pardonjohnnycash@gmail.com. Paste papers developed in 18th Century Germany, have much potential beyond their traditional use as decorative patterned papers for book and box covers and end sheets. The term “paste paper” refers to a method of decorating the surface of paper with acrylic or tempera paint mixed in a “paste” medium and applied in various methods resulting in patterned papers. In this workshop we will learn basic techniques for patterned, and pulled papers. We will then learn to make a “tabletop monotype” paste paper and will create two-sided papers using kozo, handmade mulberry paper. All paste papers may be used in subsequent projects, such as a book cover or as a background layer for a relief print, silkscreen or letterpress printing. Rory Golden teaches workshops at the Center for Book Arts in NYC, which he directed from 2000 – 2004, the San Francisco Center for the Book, the Long Beach Museum of Art and numerous colleges and universities around the country. He holds an MFA in Book Arts from the University of Alabama and has been an artist in residence at the Bemis Center for Contemporary Arts and Yaddo. His artwork is in public and private collections around the country. For more information, visit the Atlanta Printmakers' Studio website and click on the "Classes" link. Topophilia: Love of Place: This exhibit is about places that are near to our heart – rural or urban, public or private, internal or external, microscopic or macroscopic, singular or plural, real or imaginary, past or present. Topophilia comes from the Greek words topo- and philia-, literally meaning love of place. The exhibit is open to all interpretations on the theme. Juror & Curator: Natasha Lovelace Habers, Assistant Professor of Art, Kennesaw State University, Georgia. Open to artists living or working within the USA. Email Charlotte Lowry Collins: charlotte@otacenter.com to receive a PDF entry form and submission guidelines.